TOA Electronics Southern Africa recently added new products to its range of voice alarm systems and IP intercom systems. The TOA VX-3000 is a reliable and energy-saving voice alarm system that combines all important functions for public address, voice alarm and background music in one unit frame. The limited number of components makes the design and installation much easier, as well as saving space and reducing cable complexity. 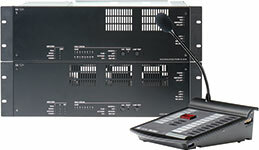 This enables rapid system configuration and makes the VX-3000 a cost-effective system. The VX-3000 voice alarm system can be installed as a decentralised system (using an IP network). This will reduce cable runs as the headend equipment can be installed in different areas of the site. The voice alarm system is EN 54-4 and EN 54-16 certified. It uses low-loss modular Class-D amplifiers with three different output ratings. These can easily be removed or replaced simply by unplugging them, so there is no need for specialist tools. By using modern power supply switching technology, the system becomes much more energy efficient and keeps the operating costs low. Thanks to its flexible and scalable system architecture, the VX-3000 system can be used for both small and large applications, with up to 256 remote microphones and 128 audio sources. TOA has also launched the N-SP80 range of SIP video intercoms as well as the N-8000SG SIP Gateway to integrate the TOA N-8000 IP intercom to the SIP intercom range or with SIP PABX systems. The three contemporary SIP-based intercom stations offer high-quality audio and video communication and a user-friendly electronic access control system. 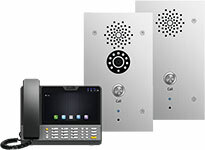 The SIP intercom stations are compatible with a variety of SIP servers (Cisco, Avaya, Asterisk, Genetec) and enable peer-to-peer communication with an unlimited number of connectable stations within the SIP system. It can integrate with external SIP compatible systems through a SIP server. Peer-to-peer mode is also available for standalone system operations without SIP server environment. Additionally, multi-cast transmission ensures paging into multiple zones. These systems are ideal for schools, hotels, healthcare and industrial facilities, as well as offices and malls. TOA Electronics Southern Africa was appointed as the sole distributors for sub-Saharan Africa by Cambridge Sound Management, a manufacturer of sound masking and speech privacy systems. This means the company now offers the QtPro and DynasoundPro sound masking technology which helps organisations of all sizes protect speech privacy, reduce noise distractions, and increase comfort and workplace productivity. The proprietary sound masking technology works by adding a low level, unobtrusive background sound to an environment. The ambient, specially-optimised sound masking drastically reduces the intelligibility of human speech. The result is a workplace that is measurably more acoustically comfortable and private without sacrificing the architectural design of the space. The Cambridge Sound Management Systems are aimed at call centres, open plan offices, healthcare facilities, corporate and government offices, conference venues as well as many more applications. TOA is also the supplier of Fire Phone Systems, which fully comply with BS5839, Pt 9. The systems supplied are used as a fire telephone system, disabled refuge call system or as a combined system when both fire telephones and disabled refuge points (allowing people who cannot easily evacuate a building to communicate with a central control point during a fire emergency) are required. Additionally, TOA also distributes the Ampetronic hearing loop systems. An established technology, hearing loops help with hearing loss, increasing the clarity of amplified sound, in any busy environment, by working in conjunction with a person’s own hearing aid. Ampetronic hearing loop systems, also known as audio induction loop systems or T loops, are designed and built to the highest standards and can be used in many applications, including retail stores, banks, airports, bus terminus’ and railway stations, schools and universities, houses of worship, museums, conference venues and more. Ampetronic also manufactures counter intercom systems, which are designed for applications where there is difficulty in communicating between staff and clients (due to thick glass). These systems are ideal for banks, ticket offices, information kiosks, security booths and an optional glass mounted hearing loop system can also be integrated into the system to enable those that are hearing impaired to easily communicate with staff. The counter loop systems are becoming popular in retail applications worldwide as retailers implement systems so that cashiers can easily communicate with hearing impaired clients and vice versa, clients can easily communicate with staff that are hearing impaired.